1900-1910 File Identification:Nashville-056 Date Scanned:2016-04-14 Source of Scanned Image:W.H. Outlaw Jr.
Throw-back Thursday. Crowd-sourcing for confirmation/refutation of the identity of this image. I think it is Mrs. Bob Akins, but I am not on solid footing. What do you think? The back of this image is labeled "Miss S.J. Murry"; the script was running off the page and the surname might be Murray. The back of the image is also labeled "Nashville, Ga" and "June 8 1907" and "Made Oct 1878." All labels appear to be made in one hand; that is not to say that the labels were made at once or at the time of the photograph. I have not accepted the "made" date of 1878. I think that this date is improbable because that was the year of the development of practical dry-plate photography (https://graphics.stanford.edu/courses/cs178/lectures/history4-tool-27may14.pdf). I do not have other images that predate 1880 that were not made in a studio. I realize it is possible to have a mobile darkroom, . . . . I am aware of only two S. Murrays who could be the subject, but I tentatively exclude one: Sarah née Hendley (1851-1929) married John Murray (Murry, Mury) on Aug 4, 1869 (Jessie Paulk Marriage Records); in 1880 (FC), this Sarah Murray lived in the general vicinity of the present-day W.H. 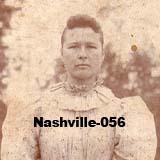 Outlaw Farm (now a Centennial Family Farm, Nashville-009: http://www.southernmatters.com/image-database/display-selected.php?id=170) and her family's portrait was in the collection of Joseph N. and Bertha. L. née Watson Outlaw, whose farm joined the present-day W.H. Outlaw Farm). According to the Keith Family Tree (http://person.ancestry.com/tree/11181196/person/1131322565/facts), this Sarah descended from Elmore Hendley (1799-1859), who came to present-day Berrien County about 1835 and four of whose seven sons were killed in the American Civil War (Hux 2:45). This Sarah Murray's image bears no resemblance to the present subject and there is likewise no resemblance whatsoever in the handwriting on the backs of the two images. 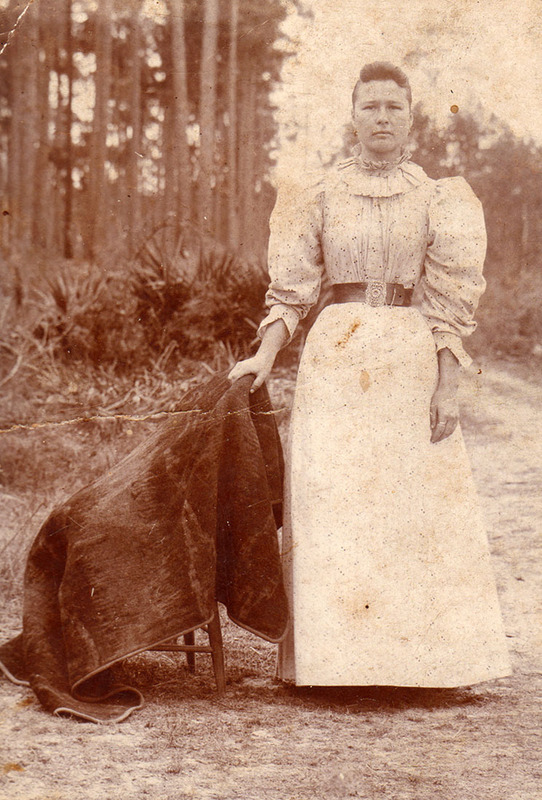 I think that this is the image of Sarah Jane Murray, who married Bob Akins (Aikins, Aikens) on Feb 25, 1900 (Paulk). There is circumstantial evidence for this conjecture and most of it relates to the relationship between my mother's family and the Bob Akins family to explain why I would inherit this image. Thus, from my parents' collection, I have other images of this family. Carl and George, sons of Bob and Sarah Akins, are shown in http://www.southernmatters.com/image-database/display-selected.php?id=212; daughter Flora is shown in http://www.southernmatters.com/image-database/display-selected.php?id=1018. The handwritings on the back of the children's photos and this one are similar, but different (Nedra compared it with the similar but distinct handwritings of my mother and sister.) Continuing, Bob and Sarah were enumerated as a couple in GMD 1157 in 1900, one page away from Jeremiah May (who lived near the present-day W.H. Outlaw Farm, who was in the same company as my greatgrandfather Outlaw in the Civil War, who named one of his sons, Judge E.C. May, after my 3d greatgrandfather John Ellis Connell, and who married Winnie Akins, d/o Green Aikins (Hux 1:1) as was Bob's mother Sarah. As one infers, their ties to the area were strong; indeed, the widow of Bob's uncle (CSA casualty John J. Akins) viz. Wealthy Ann née Mullis (my 2d greatgrandmother Sutton's sister) is buried in Lost Cemetery 223/10 (my designation for the plowed-over cemetery that is someplace in the field across from Jimmy Lane's home; a cemetery that was collateral damage in my greatgrandfather Watson's purchase of most of 223 in 1905). At some time—which could be easily determined, though I haven't—the Bob Akins family moved to what was the William E. Connell homeplace on Lot 223; that place is still in the Akins family (and a Centennial Family Farm). Ellis Connell (my 3d great grandfather and William's uncle) lived on that lot, too, at a site later called the John J. Giddens Place (thanks to the Griffin papers, and where is that, exactly?). As a sidebar, William E. Connell had owned all of Lot 223 and sold it to John Ellis Connell in 1866 (http://www.southernmatters.com/image-database/upload/Outlaw/Outlaw-366f_red.jpg ), i.e. Griffin appears to be in error about joint ownership so at least a flag is raised about the exact location of where Ellis Connell lived. In 1910, we find the Bob Akin1s family, including his mother, Sarah Akins, and his father, King H. Tripp. Jumping again, this time to 1930, a smaller Bob Aikins family remains in GMD 1157, one page away from the home place (now a Centennial Family Farm) of my grandfather L.G. Outlaw. Finally, I see a familial resemblance between the eye set of this person and her putative grandson, John "Pete" Akins. Note: As mentioned in the banner, this area of Southern Matters is private; if you are not a family member, friend, or invited guest, please enjoy the public areas of Southern Matters or exit. Thank you for following our Honor System. This file may contain copyrighted material; the authority to grant permission for its use does not rest with us. Otherwise--for our original material--the following citation format is suggested: \"Southern Matters, accessed yyyy/mm/dd.\"